Reeves, with an assist from a team of strategically deployed spectacle-watchers, gets right into the raucous spirit of the Democrats' extravaganza at Madison Square Garden, picking up on everyone from Chairman Robert Strauss to 17-year-old Clare Smith, official youngest delegate, to Annie the whore who fell short of her $800 per diem expectations. It's a frenzied, hysterical circus with hundreds of private campaigns going on even as the delegates prepare to nominate the peanut farmer. Reporting on all the carefully-rigged media spontaneity, Reeves doesn't miss a beat: from the NYPD bomb-sniffing labrador, to Tom Hayden the California delegate and Tom Hayden ("the real Tom Hayden") who set up the telephone communications system, Reeves leapfrogs from podium to massage parlor to hotel suites. He will tell you all about Carter's "private section," which Reeves claims contained a little "espionage room"--the better to bug the communications systems of the other candidates. L.A. lost out on the Convention because, well, "The Democrats were convinced that the governor of California was crazy" and the word was out to keep him from the podium at all costs. The Svengali of the proceedings is Strauss who had, early on, perceived that his party required "sedation" to avoid the cantankerous divisiveness that led to flubbing it in '68 and '72. 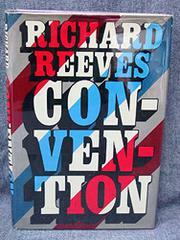 Amid the barrage of overheard, overheated conversations, many of which won't bear repeating in polite society, Reeves has time to wonder if Carter, with his ritual laying on of hands, represents some new kind of political force, if Strauss' convention--stage-managed to contain the "weirdos"--bespeaks a day when candidates and Presidents may lead via primitive symbolism. . . . Anyone who didn't get tickets for the fabulous floor show can be there via this vastly entertaining, adrenalin-rush of a book.